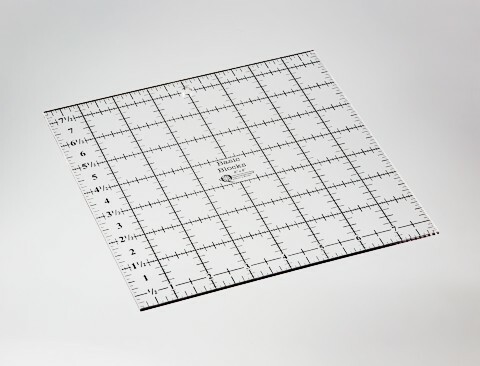 Templates (Rulers) and Machine Quilting, Wednesday May 1, 2019 -4:00 pm to 5:00 pm, room 200C -Babylock Lecture. Do it Yourself Designs...Really. Thursday, May 2, 2019 - 6:00 pm to 9:00 pm, room 300B Pro-stitcher Lecture/Demo. Template Mania. Saturday, May 4, 2019 - 8:30 am to 11:30 am, room 200B Bernina. Are you ready to take the next step beyond stitching in the ditch and meandering with your home machine? Learn the basics of machine quilting with templates -aka rulers. Patricia will be teaching a class on Templates. More info to come. Patricia is a traveling teacher! If you want Patricia to teach at your guild or show, contact her at patricia@quiltersrule.com or call 800-343-8671. Ever dream of being able to create your own quilting designs? Are you convinced the Artistic fairy bypassed you when she was handing out talent? Join Patricia as she shows you how to move templates to create stunning designs that look complicated, but are in reality the simplest of shapes. She will teach you four techniques for moving templates. These techniques can be used by all, regardless of your method of quilting (hand, domestic machine, long-, mid-, or short-arm machine). How to transfer the design to your quilt using a variety of methods will be discussed. Join Patricia in learning how to release the creativity inside you. You’ve got a wonderful design, but, oh my, it has some rather large open spots. You need something, but what? How about a fill? Oh no, I’m not creative... I don’t do freehand... ACKKK! Solution – grab a template. Create your own creative fill! Learn how to use templates to fill a space with a variety of different looks all by using different templates. Included in the discussion will be non-traditional Crosshatching. No artistic talent needed! All quilters welcome regardless of method of quilting (hand, domestic machine, long-, mid-, or short-arm machine). Wouldn't it be nice to be the creator of a design that people ohhed and ahhed over? 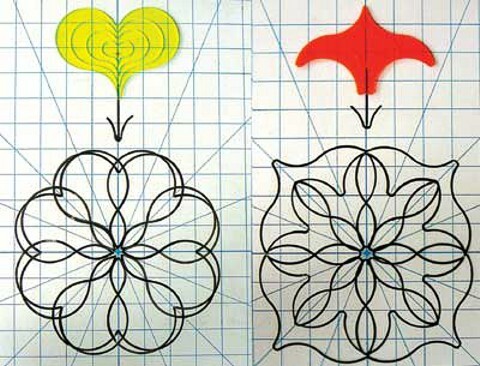 Explore the creative possibilities templates open for those of us who cannot draw. No artistic talent needed! Hands on drawing class where you will be doing the drawing yourself! Are you ready to take the next step beyond straight crosshatching? Curved Crosshatching adds elegance to any quilt. Anything can be crosshatched…not all crosshatch works in all quilts, but with the information learned, you will open a whole new door to your creative juices. All quilters welcome. A slideshow presentation showing how we make our rulers, mats, and templates. Approximately 45 minutes with question and answers. If you have a guild or group that you host, We would love to present to them. Do you have a home machine and are ready to step beyond stitching in the ditch and meandering? Perhaps you have heard of a particular foot you can put on your home machine to use templates when quilting? Or perhaps you have a mid- or long-arm machine and you want try using templates? Learn the basics of machine quilting with templates (aka rulers). Find out: Why templates are made out of different thicknesses; Strategies for getting really small or getting points. Get the facts and knowledge before you leap into the exciting world of templates and all the possibilities. Your wonderful design has some rather large open spots. How about a fill? But I’m not creative! Solution –A template. Learn how to use templates to fill a space with a variety of different looks all by using different templates. No artistic talent needed! All quilters welcome. Tired of standard quilting designs? Looking for different block quilting designs you create? Would you like to have a design that creates continuity throughout your quilt yet is not the same design in each block? From complex designs for plain blocks, to simple designs complex pieced blocks, this class will use templates create quilting designs for blocks. No artistic talent needed. All quilters (hand, home machine, long-, mid-, or short-arm machine) welcome.